I was introduced to Amrita through Blogosphere. In the very first instance I was attracted to her amazing Baked goodies. she is one of those not so old bloggers who has created a name for herself in the blog world in a very short span of time. 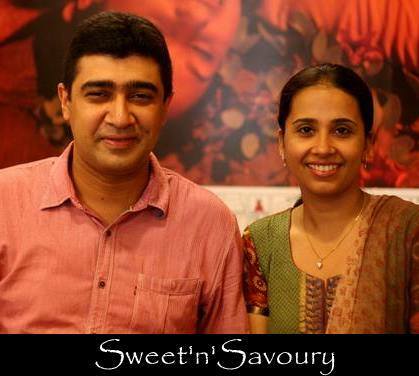 She with her husband Vishal post amazing innovative recipes in their blog Sweet and Savoury. Recently I have come to know her personally and loved her down to earth, always ready to learn attitude. She is a darling friend and I look forward to cherish our friendship for years to come. Here is a small excerpt of a chitchat that we had as part of the Know your Kolkata based food bloggers event. We, Amrita and Vishal Tupper, are a husband wife duo who has found a common passion in the world of food. We love to experiment with new ingredients, with new techniques and find cooking a common platform where we love to spend time in each other's company. Vishal is by large a savoury person who loves to create and experiment with seafood. Amrita, on the other hand, is a crazy baker and loves to whip up sweet things. Vaanya, their adorable two year old daughter loves to eat both. By profession, Amrita is a physiotherapist who is enjoying her homemaker life looking after their daughter and Vishal is Manager Administration for a large Tea Company and has a passion for adventure. How did you get attracted to cooking and what was your first dish? Amrita: I had no attraction to cooking till I got married. I used to bake occasionally but entering the kitchen was a big chore for me. Marriage changed my boring outlook towards cooking and with Vishal's support I got the courage and enthusiasm to experiment and thus started my affair with cooking/baking. My first dish was a cake, a family recipe. Vishal: I had an inclination to cook since I was in my teens. I had an everlasting love affair with eggs to start off with. Egg was my staple diet 365 days a year (and 366 days on leap years). I discovered seafood here in Kolkata and since then never looked back. The turning point in my cooking journey came after seeing Masterchef Australia. It really inspired me to take my cooking a bit more seriously and I have never looked back since then. My first dish was dal. 3. Who has been your biggest influence? 4. How did you start your blog? Our blog was basically started to keep a note of our experiments and kitchen trials and to share our world of cooking/baking with a larger audience. We love to share our tried, tested and tasted recipes. Amrita: I love trying to take decent pictures to make my food look as good as it tastes. Vishal: I love to write and share the food experience with others. It is utmost important for us to read our readers opinions and try to rectify, improve or answer to their comments. A blog after all is our experience that we share with the world and their opinion matters a lot. No funny incidents so far for us. Dislikes: Free access to copy someone’s hard work in one click and using it as their own work. Amrita: Certainly, still in the kitchen! For me, it’s a love affair that will continue for a long time. Earlier I found cooking boring and very dull but now I look forward to try my hands on some new recipes and some new bakes. There is so much to learn in terms of ingredients, cuisines, techniques. It’s an amazing world and I have just started my journey. Vishal: I usually have a very clear well defined goal in my life. But food is my passion and a therapy. I would like it to leave it as it is and see where my association with food leads me. I am open to the journey without a pre-determined milestone. Just want to enjoy it. If you loved knowing Amrita and Vishal. Then dont forget to check their amazing blog Sweet and Savoury. Thank you for the very sweet introduction. Like I keep mentioning it again and again, I am glad to have found my mentor as a dear friend. Even i love her amazing bakes, especially her tricolour cheesecake.. Wonderful to know more about this beautiful pair. Great to know you both even though through net. love reading about them...wonderful post..
Good way of introducing other fellow bloggers. Good work. Kolkata bloggers group having a good time...enjoy and be merry!! !